Apparently It’s not a picnic basket for your delicious foods, but the iPhone iPod dock speaker called PartyCube can bring you delicious music. Just as we see, the iPhone and iPod docking station looks really like a fashionable small basket. Of course, PartyCube just can hold your iPhone or iPod. With the built-in multi-directional speakers and unique appearance design, the dock speaker with LCD screen can provide surrounding sound to the entire room. The rechargeable battery offers you about 4 to 6 hours of playback time. Apart from that, the dock speaker can also charge the iPod and iPhone. Integrated AM/FM radio allows you to enjoy music from radios. And line-in jack lets you connect other audio devices even if you forget iPhone or iPod. 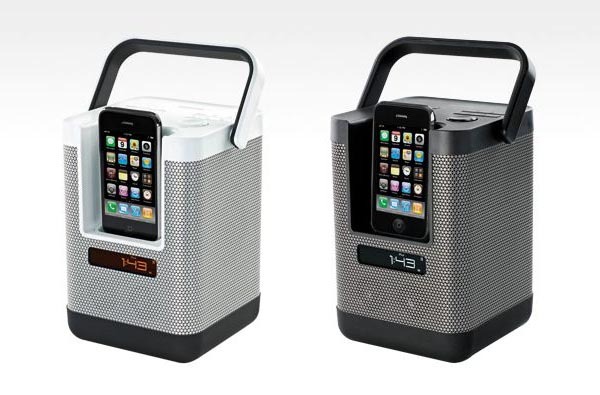 PartyCube iPhone iPod dock speaker comes in two colors: black and sliver. Each one is priced at $99.99 USD. If you’re interested, jump to memorex for more details. Additionally, if you need more, you might like to check the Hello Kitty dock speaker or the Sony SRS-V500IP dock speaker.